An interesting day on the currency markets as the NFP data triggered a decisive move in the euro dollar pair, which closed the trading session and the week sharply lower, and ending with a very wide spread down candle which breached all three moving averages, and confirmed the weakness we had first seen with the deep hanging man candle of the previous Friday. The bearish sentiment had been further reinforced by Thursday’s shooting star candle which was duly confirmed on Friday. 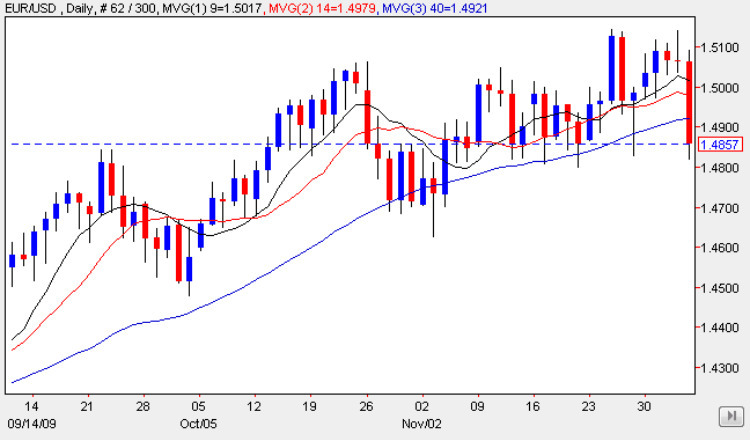 With the failure to breach the 1.5150 price level, the daily chart is now exhibiting a bearish tone in the short to medium term, which will be further confirmed should we see the 1.48 price level breached this week, and if so then a deeper move towards 1.45 becomes increasingly likely with a possible re-test of the 1.43 support area in due course. However, in the short term we need to wait for Friday’s price action to be confirmed with a deeper move lower and in particular a break and hold below the floor of the recent sideways price congestion, but if the 1.48 level is breached, then this will signal that the bullish trend has broken down for the time being, with this area then creating a potential resistance to any recovery higher in due course. The most significant item of fundamental news for the euro today is testimony from Jean Claude Trichet (President of the ECB) before the Economic and Monetary Affairs Committee of the European Parliament in Brussels when traders will be listening out for any clues as to the Bank’s interest rate intentions. Trichet often uses these public set piece events to signal the Bank’s future monetary policy and thinking. This morning also sees release of the Europe Sentix Investor confidence data which is expected to come in -4.3% against a previous of -7.0. Later German factory orders are also expected to come in at 0.6% – against a previous of 0.9%. Meawhile in the US there is also a speech from Fed Chairman Ben Bernanke due after the London close. He is expected to speak at the Economic Luncheon Club in Washington on the topic of “Federal Reserve Frequently Asked Questions”. The only other item of news for the US will be the release of the Consumer Credit data which measures the total value of outstanding consumer credit. This is expected to come in -9.6bn, down from previous & evidence to the extent that individuals are attempting to pay back their debts & a significant number as it correlates with consumer confidence & spending.